For more than 42 years, CCNMA: Latino Journalists of California have fought to foster an accurate and fair portrayal of Latinos in the news media. That includes using language that is accurate and not derogatory. 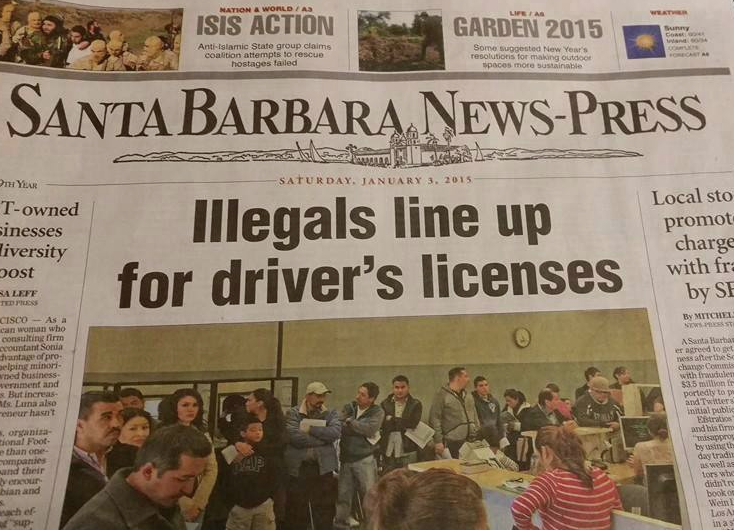 On January 3, 2015, there was a headline in the Santa Barbara News-Press that read: “Illegals line up for driver’s license,” and the phrase “illegal alien” was used in the story. Apparently, the Santa Barbara News-Press routinely uses such phrases. The use of the phrases “illegals” and “illegal alien” by the news media to describe human beings is dehumanizing, derogatory and inappropriate. We understand the space limitations in headlines, and the history of using creative shortcuts for words to fit on headlines, but inappropriate words should still be avoided in stories and in headlines. This is not an attempt to be “politically correct,” but rather a reminder that as communicators, journalists should use words that are clear and understandable in today’s times. “Illegal Aliens” should be avoided, as journalists already do with other forms of governmental and police jargon and legalese. Just because the government continues to use a dehumanizing term does not mean that journalists should.